After doing the combined LPMM and 180 deg rotation of the muffler outlet pipes ( which is the 'GS1' portion to accomodate NB wide ovals on a WB car ), the rear fender area appeared to run noticibly warmer than previously. I was not overly satisfied with the heat shields, so replaced them with fiberglass header wrap as an experiment: should have shot some before/after temps ... but did not; however, there appears to be a noticible temperature drop after wrapping the piping. I will run with this for a while ... but think that the heat shields may end up in the recycle bin: one could reinstall them over the wrap if desired. Ten feet of 2" wrap would do each muffler nicely .... I only had a scant 8.5 ft to spare each side from the reminants of a coil kicking around .... but I did say that it was an experiment ... Stainless tiewraps are the way to go to secure the wrap - but being fresh out, stainless 2" hose clamps do just fine. Anything wrapped with this stuff needs to be inspected from time to time as the wrapping does hold-in a lot of heat. Every header I have wrapped cracked after a year of use. Then again, header primary pipe do run a lot hotter than that of exhaust downstream. A valid point to check the piping condition at some point ; however, anything downstream of the CAT does run substantially cooler than the headers. 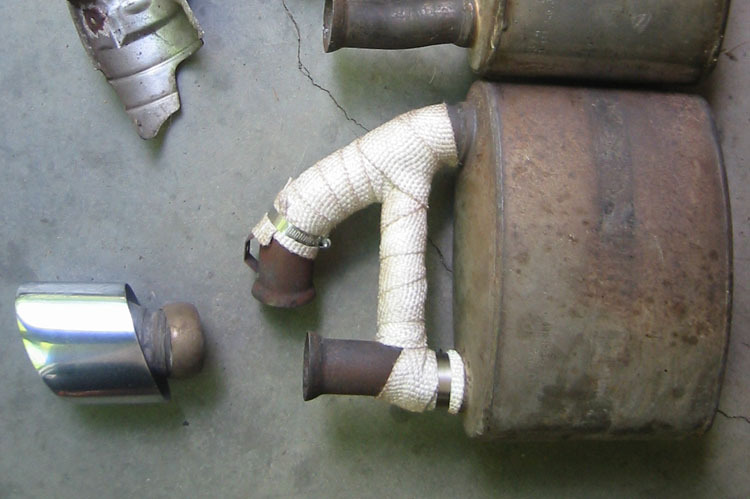 Regarding the risk of corrosion, I had assumed the muffler piping to be of SS409, a ferritic stainless. The body shell is also ferritic ('magnetic'), wheras the end caps appear to be a SS304 austentic alloy. Perhaps not ...? ?